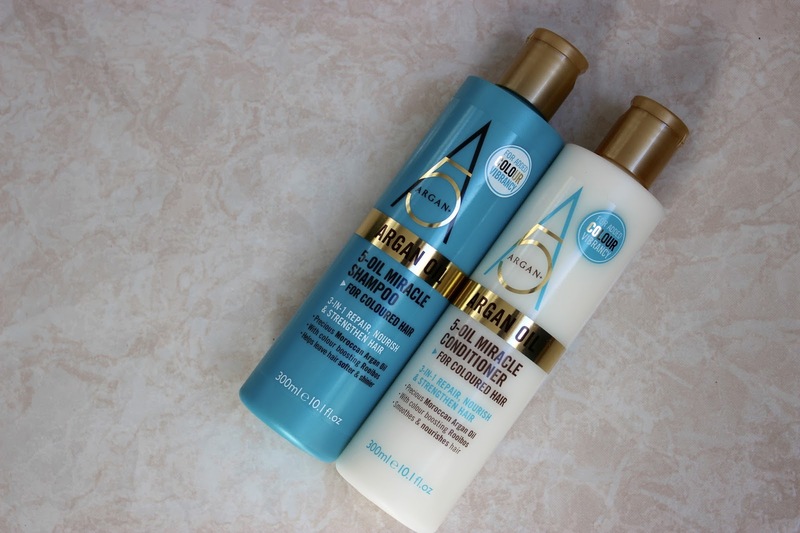 I was recently sent the Argan+ 5 Oil Miracle Shampoo and Conditioner to try, which I was intrigued by as I don't tend to think of the brand as a haircare one. The first thing to say as a caveat to this review is that I don't have coloured hair so I can't comment on the claims surrounding colour protecting properties. That said, I love using oils to nourish my hair and as the Shampoo and Conditioner are based around a blend of oils, including Moroccan Argan Oil, Lavender Oil, Baobab Oil, Ginger Root Oil, Kukui Seed Oil, Moringa Oil and Sacha Inchi Oil, I was excited to try them. The company claims that the Shampoo and Conditioner are designed to repair, nourish and strengthen hair and contain colour protecting Rooibos extract to help enhance and lock in colour intensity and prevent fading. On first impressions, I liked that the plastic bottles are easily distinguishable from one other, with the Shampoo being presented in a Moroccanoil-esque turquoise blue bottle and the Conditioner in a white bottle. They aren't the most luxurious but the packaging is eye-catching (particularly that of the Shampoo). They have flip top lids for ease of use in the shower. The directions were clear and easy to follow. The Shampoo bottle was opaque so it was difficult to tell how much product was remaining whereas the Conditioner bottle was semi-opaque, which I preferred, as I was able to see how much product was left. The company claims that the Shampoo is powered by vitamin E rich Argan Oil along with a blend of nourishing oils to gently cleanse hair without stripping it. They say that the vitamin packed formulation delivers incredible softness and shine, leaving hair more manageable, shiny and colour vibrant. I enjoyed using the Shampoo, which had a comforting and warming scent which had a hint of the exotic and smelt luxurious, without being overpowering. The Shampoo had a gel texture, with the golden colour adding to the sense of luxury and reiterating the nourishing oil ingredient message. I found that the Shampoo produced a generous lather and, as inherently seems to be the case with most shampoos, rinsed away easily. I was highly impressed to note that it didn't irritate my sensitive scalp, as many shampoos (particularly budget friendly ones) can. The company claims that the Conditioner helps hair to keep its hue and vibrancy with its deeply strengthening formula. They state that the intensively nourishing Argan+ Synergy blend delivers optimum conditioning and smoothing benefits, leaving hair stronger, shinier and softer, ready to be styled. Again, I enjoyed using this product. The Conditioner has a light cream texture which felt luxuriously silky. It was relatively easy to dispense although a tube would have been more convenient. I found it easy to work through my hair. I found the Conditioner to be more heavily perfumed than the Shampoo but it smelt like an expensive product. It was indulgent, pampering and a pleasure to use. Following use, a comforting scent lingered very delicately. Rinsability was average. I was impressed with how smooth my hair looked following use and noted that my fine hair wasn't weighed down. It felt wonderfully soft and looked shiny yet remained manageable. I must confess that I hadn't had the highest expectations of these products but actually really enjoyed using them and I was highly impressed with the results. At £5.99 for each of the 300ml bottles, I feel that they represent fantastic value for money and would recommend them.